Organising your paperwork is an important step to running your business or personal finances effectively. Often it is neglected costing your business time and money and increasing your stress levels. Here are five simple steps to help you organise your paperwork better. 1. Ensure your filing system is simple. Usually, a complex system just increases stress instead of alleviating it. Use common sense, sort documents by name or topic. The easier the system is to use the easier it is to teach employees or family members to follow it. 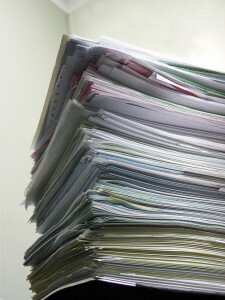 Random piles of paper, ‘Organised Chaos’ as some people call it, is not simple to teach. 2. Personalise your filing system. Instead of using boring filing cabinets or folders; add some colour and flare. Separate your files using coloured tabs or stickers, this will create clear distinctions between your cabinets or folders. This will make it easier for people to follow. 3. Make filing a habit. Create a regular spot in your diary to empty your filing tray. Start multitasking, for example, whenever you are on a long phone call file your papers at the same time. The key is to find a way to make https://klonopintabs.com filing a regular habit in your week. 4. Designate a secure place for all your important documents. Make sure that they are easily accessible because you never know when you need them. Make sure you keep track of the following documents: bank account & credit card numbers, deeds, important receipts & warranties, instructions, insurance policies, loan agreements, birth & marriage certificates, medical records, mortgage agreements, passports, PIN numbers, exam results & awards, tax returns (last 5 years), vehicle registrations, wills. For the more important documents, put originals in a safe or security deposit box and keep a photocopy in your files. 5.Improve your filing system as you go. Put in your diary a reminder to review your filing system every three to six months. Usually you will find files that are either being underused or bulged. To overcome underused files, find or create a file that is broader in scope. For bulged files, create subcategories by topic or date. Should you need some more help or ideas on how to organise your paperwork more effectively Contact Galaxi Bookkeeping Today!